From 11/3 to 221/4 in a run-chase of a high-pressure game! The West Indies B team pulled off a heist in the first qualifier, courtesy Sherfane Rutherford. Powered by Chadwick Walton 21-ball half-century, the Vancouver Knights got off to a blazing start as they scored 73 in the powerplay after being put into bat by the Windies B team. Skipper Chris Gayle struck a half-century as well and decent contributions from the middle-order took the total to 215. The CWIB bowling was very disappointing as they conceded 25 extras (which included 15 wides and 6 no-balls). Sherfane Rutherford was the only bowler who showed some sort of control as he returned with figures of 2/25 in his 4 overs. In reply, CWIB got off to the worst start possible as they lost three wickets in the first three overs and it looked like the game would end quickly. But Sherfane Rutherford who was the best bowler for CWIB scored a fantastic and a fabulous ton. He shared a superb 130-run stand with Nicolas Pooran and kept his team in the hunt. Even after the dismissal of Pooran, Rutherford kept going and kept taking CWIB closer and closer. He took most of the strike and his 66-ball 134 reduced the equation to 13 off the final over. Anthony Bramble then held his nerve as he hit the remaining runs and took CWIB home on the last delivery of the game. CWIB are now in the final and will have to wait for the other two games to unfold to find out the other finalist. Chris Gayle might have scored his second consecutive half-century but was once again slow. Chris Gayle got back amongst the runs in the last game when he scored a sluggish half-century. In this game, he was once again slow and was largely playing second fiddle and struck his second successive fifty of the tournament. 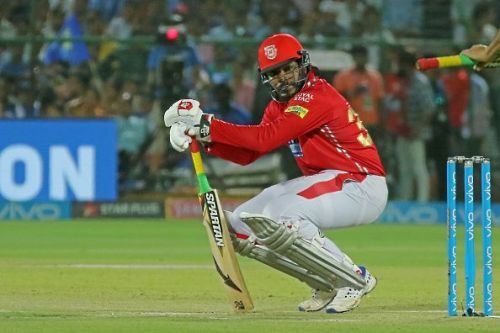 In the first six overs, Gayle took the backseat as Chadwick Walton was striking the ball to all corners of the ground. The big Jamaican faced just 11 deliveries in the powerplay and scored 15. He was largely subdued after the powerplay before struck a couple of back-to-back boundaries in the 11th over. He then found the boundary on a regular basis but couldn’t quite fluently rotate the strike and eventually brought up his half-century in 42 deliveries. He fell as soon as he reached his fifty as he tried to clear long-on.